Christmas is less than 11 weeks away. We all know that it comes every year on December 25th and that there are many, many expenses associated with Christmas. And yet, many of us become frantic in November and wonder how we’ll pay for everything. If you’ve not yet set aside any money for holiday shopping, know that there are things you can do now to reduce holiday expenses and round up the extra money. Take these steps now before any more time passes. The longer you wait, the harder it will be to come up with the cash you need. There’s no point in using more money than you need to. Take these steps to determine how much money you’ll need to spend and then to lower your costs. Estimate how much you’ll need. The first step is to estimate how much you’ll need this holiday season. Make a list of all of the family and friends you buy for and how much you usually spend. In addition, don’t forget other people you may give a little extra to like your mailman, hair dresser, and child care provider, to name a few. See if there are any places you can cut costs. If you exchange gifts with all of your adult siblings, maybe this year you can see if they’d be willing to do a name draw. Then you’d only give a present to the person whose name you drew, which could slash your spending depending on how many siblings you have. Can you make any presents? If you don’t have a lot of cash, making presents can be the way to go. However, you must ask yourself two things. First, do you have time to make homemade Christmas presents? Second, can you make something the recipient would actually like? After all, there’s no point in making something just so you can give a gift, especially if it’s a gift the recipient wouldn’t like. Some popular items include homemade baking kits (think all of the ingredients for soup or brownies in a jar), homemade jewelry, artwork, crafts, and food. You could also make coupons for your services such as “one free night of babysitting” for a couple with young children. Now that you know how much you’ll need to spend, the next step is generating some extra cash. Cut unnecessary expenses. The first place you can look to make some money for holiday spending is in your non-essential spending. Eating out is usually a large expense for most people. If you stop eating out for four weeks, you may have as much as $100 to $300 set aside for gifts, depending on how frequently you eat out. Another area to focus on may be entertainment. Skip going to the bar or the movies for several weeks, and you’ll start to accumulate a nice pile of cash. Take on extra work. Are there any jobs you can work on the side like babysitting or freelance work from home? Can you work extra hours at your job? Would you consider taking a seasonal job at the mall? If you’re hard pressed to find extra work, you could always donate some plasma for a month to make extra money that way. Finding temporary, extra work is a great way to drum up cash. Generate free cash. Generating free cash sounds too good to be true, but it’s not. If you have the time, you can open a Swagbucks account and search the internet for points that can be traded in for gift cards, or you can take advantage of bank cash bonus offers if you open a credit card or checking account. You can also try taking surveys. If you’re trying to find ways to generate money for the holidays, try some of these strategies. And come January, remember that saving a little bit each week for the entire year is a much easier way to go. 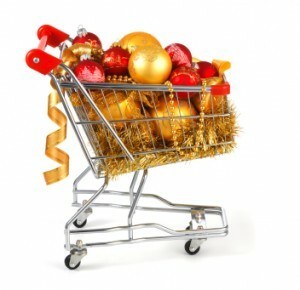 What’s your favorite strategy for generating extra cash for the holidays? We used to have a Christmas Club account at the bank. Do they even still have those? It was kind of weird having a special account like that, but it did make you less likely to make withdrawals from it because you could never forget what that money was for. One thing we always fail to account for in our budget is stocking stuffers – we get through buying all the gifts and decorations and supplies, and then my wife looks at me and says, “Oh we have to get stocking stuffers yet.” not a major expense but we seem to forget about it every year! I like the idea of making gifts. Even better if you can use recycled materials. Also, my credit card points can be used for gift certificates, so if you just use a credit card for regular purchases all year round, you might be able to finance a free gift giving season.